We stumbled across an interesting podcast this week from Australian radio station FBI FM. On their weekly magazine show All The Best they ran an item about Ernesto Juan Castellans, a Cuban author, journalist and hard-core music fan living and working in Cuba in the 1960s and 70s when rock’n’roll was banned under Fidel Castro’s communist regime. If you click on the link you can hear the segment (it starts about 3 minutes in). It is really worth a listen. Castellans loved many bands, foremost among them the Beatles. But Cuban youth couldn’t easily access the records and tapes of their musical idols. They could tune in to US radio though – but even doing that was dangerous because listening to US music stations was also illegal. You had to be very careful. Castellans persevered, the ban on rock music was eventually lifted, and he was instrumental in establishing the first Beatle conventions in Cuba, featuring top Beatle authors and cover bands. Those gatherings began a total shift in attitude, eventually leading to a complete turnaround by the Cuban government when it came to Beatle music. 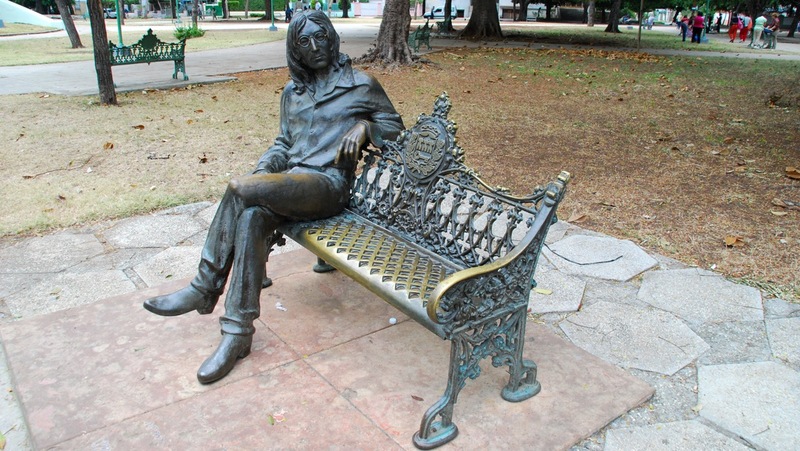 It even established a John Lennon Park in Havana (with its own official John Lennon statue): You can read more about Castellans here. This entry was posted in Beatles, Beatles Music, John Lennon and tagged Beatles, Beatles Banned, Cuba, Ernesto Juan Castellanos, Music by beatlesblogger. Bookmark the permalink.